off just a few paces. the over prior to tea. Great stuff Damian. Love the photo. Dennis with the keeping gloves on and Marsh bowling would have been the ultimate fantasy of all opposition batsmen in the ’70s! 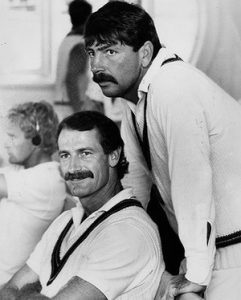 If TISM were to make a comeback I think this would be a great follow up to Lillee Caught Dilley Bowled Milli Vanilli ! But maybe the powers that be who named the stand all those years ago, 1988, knew something of the poetry of one Damian Balassone. Nice twist Damo. Wouldn’t want to be the batsman having to endure the ribbing for the rest of my days. The over prior to tea often seems to produce a wicket in every level of cricket. Just looking at the records Marsh bowled 12 overs in test cricket (0/54) – over in Pakistan I think, when the whole team had a bowl. In first class cricket he did actually capture a wicket with best bowling figures of 1/0! Was it at the WACA? Did Lillee catch it? I’d like to think so. Cheers all. That’s an interesting observation re the name of the stand Vin – maybe subliminally I picked this up I heard somewhere that Rod Marsh once took 3 wickets in 4 balls in a Country cricket game. Must be urban myth.